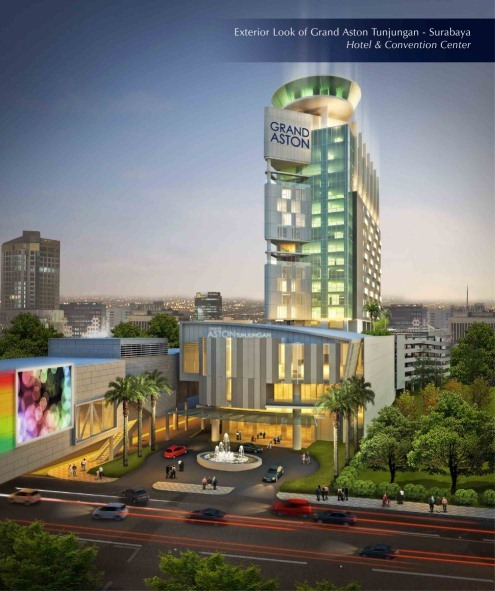 Jakarta, June 7th, 2012 – Today, Jakarta based Aston International announced that the group is in process of developing its third 5 star Grand Aston in Indonesia, the Grand Aston Tunjungan Hotel & Convention Center - Surabaya. The Grand Aston Tunjungan Hotel & Convention Center – Surabaya is the largest and most significant new hotel development in Surabaya since the 1997 / 98 Asian financial crisis. With 320 rooms and suites spread over 23 floors, 7 meeting rooms, a pillar less ballroom with a capacity of more than 1000 people, several restaurants and cafes including Surabaya’s first revolving roof top restaurant and cocktail bar and comprehensive recreational facilities such as a swimming pool, full service spa and well equipped gymnasium, the new Aston will also be the tallest hotel tower in the city promising to become a dominant feature in Surabaya’s increasingly impressive skyline. Located in the very heart of Surabaya’s central business district on Jalan Tunjungan and connected to the popular Siola Shopping Mall the new Grand Aston Tunjungan Hotel & Convention Center aims to become one of the city’s key commercial and social hubs targeting a growingly affluent and discerning Indonesian and SE Asian business clientele as well as international conventions and exhibitions. Surabaya is Indonesia’s second largest city and the capital of the province of East Java. As the main seaport and commercial center in the eastern region of Indonesia, Surabaya has become one of the largest and most vibrant cities in South East Asia and has a fast growing population of approximately 3 million.